CEYLON P50 DATED 3.6.1952 2 RUPEES IN CGC 58PQ "ONLY 1 EVER GRADED BY CGC!" QUEEN ELIZABETH II VERY SOUGHT AFTER SET! 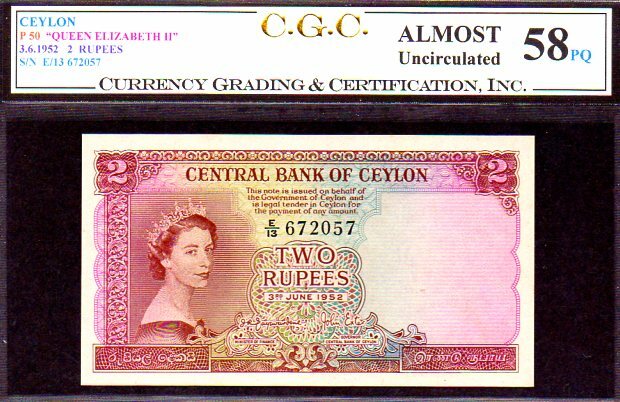 CEYLON P51 "QUEEN ELIZABETH II" 3.6.1952 5 RUPEES RARE – 1 of ONLY 3 Ever Graded by all Grading co's! CEYLON P52 "QUEEN ELIZABETH II" 3.06.1952 50 RUPEES GRADED CGC 35PQ VERY FINE! FINEST OF ONLY 4 TOTAL KNOWN!! CEYLON P53 "QUEEN ELIZABETH II" 16.10.1954 100 RUPEES GRADED CGC 35PQ VERY FINE!! TIED FINEST KNOWN CGC TO DATE!! CEYLON P55 16.10.1954 10 RUPEES CGC 58PQ (ALSO Pmg GRADED 58). QUEEN ELIZABETH GORGEOUS LOOKING PIECE AND ONLY 3 EVER GRADED HIGHER (UNC'S 60, 64 AND 66) BY ALL CO's)! WE'VE HAD A COUPLE OF VERY HIGH END CEYLON SPECIMENS, BUT NO ISSUED PIECES. THIS PIECE "LOOKS" ABSOLUTELY UNC!